Adrian Morrow won the Leinster Seniors Amateur Open Championship when it was reduced to one round due to inclement weather at The Heath Golf Club. Fintan Buckley (Chairman, Leinster Branch GUI) presenting the Algarve Tourist Board sponsored 2009 Leinster Seniors' Amateur Open Championship trophy to Adrian Morrow (Portmarnock) after his victory at The Heath Golf Club yesterday. Also in the picture are (from left) Eileen Fingleton (Lady President, The Heath Golf Club), Joe McNamara (Captain, The Heath Golf Club) and Marie Conlon (Lady Captain, The Heath Golf Club). Picture by Pat CashmanPersistent rain and flooding caused play to be abandoned with two-thirds of the field still to complete their second rounds. Morrow shot a superb first round four-under par 67 to lead by four strokes and was declared the winner. Portmarnock's Adrian Morrow won a duel in the sun with English pair Alan Mew and Stephen East to claim his third Irish Seniors Amateur Open title at an immaculate Waterville. Portmarnock’s Adrian Morrow fired a flawless final round 67 to power clear of the field and capture the Portuguese Tourist Board sponsored Irish Seniors Amateur Open Championship at Westport Golf Club. Adrian Morrow, the 2008 Irish champion, fired a super 67 to take a four stroke lead over Tony Hayes after the first round of the Leinster Seniors Open at the Heath. 1983 East leaderboardDoes it seem like 26 years ago that he beat Mark Gannon by a stroke to win the East of Ireland title for the second time? Tony Hayes finished 10 shots behind the long fellow from Portmarnock at Baltray in '83. Click on the picture to see who finished where that year. Adrian Morrow on the Irish Seniors Amateur Open for the second time. 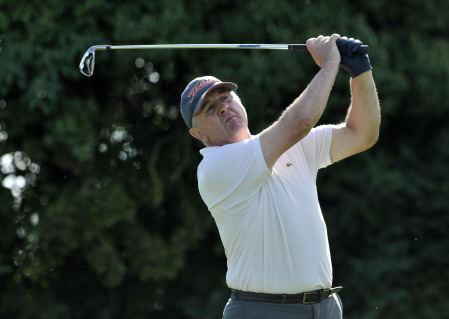 Picture by Pat CashmanPortmarnock’s Adrian Morrow captured his second Irish Seniors Amateur Open title on Connacht soil in the space of four years when he cruised to a wire-to-wire win at Athenry. Eventual champion Kevin Sheehy (Athlone) playing his tee shot at the 16th during the final round of the 2013 Leinster Seniors’ Amateur Open Championship at Knightsbrook Golf Club today. Picture by Pat Cashman/www.cashmanphotography.ieAthlone’s Kevin Sheehy added a 73 to his opening 71 to win the Leinster Senior Amateur Open Championship by two shots at Knightsbrook Golf Club.